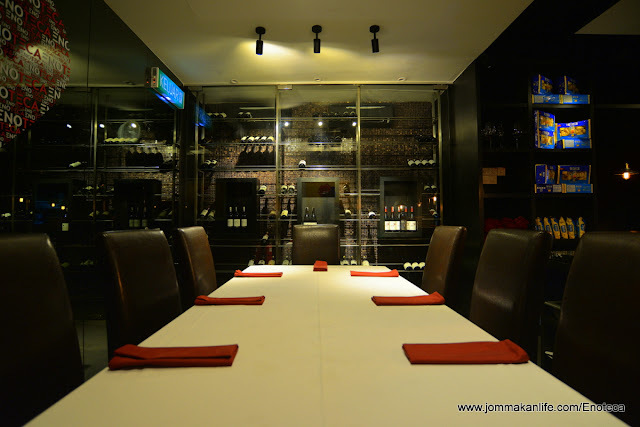 Change is a constant in life and it's no different in the restaurant business. 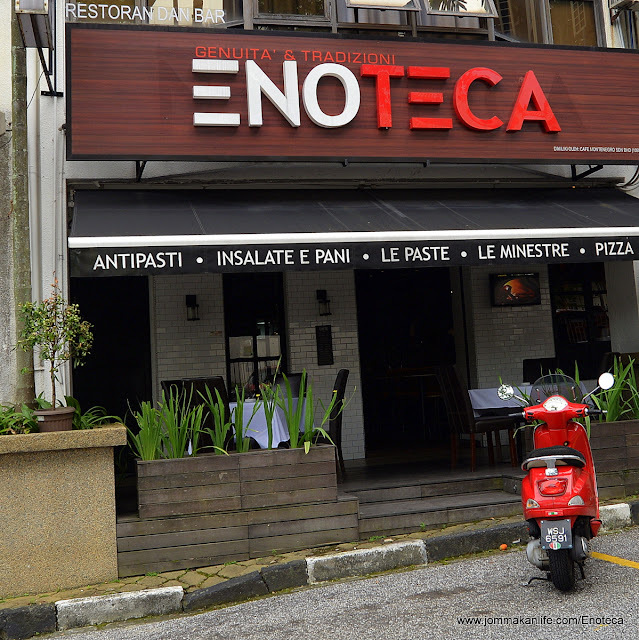 As of last October, Neroteca - a cosy Italian restaurant in Damansara Heights is now rebranded as Enoteca with new owners, management and chef in place. We had the honour of meeting the new Enoteca team recently, comprising Domenico Ferroni or Mimmo the affable Floor Manager from Roma, Annie Lim who's responsible for marketing and Abruzzo native, Chef Stefano Criber. 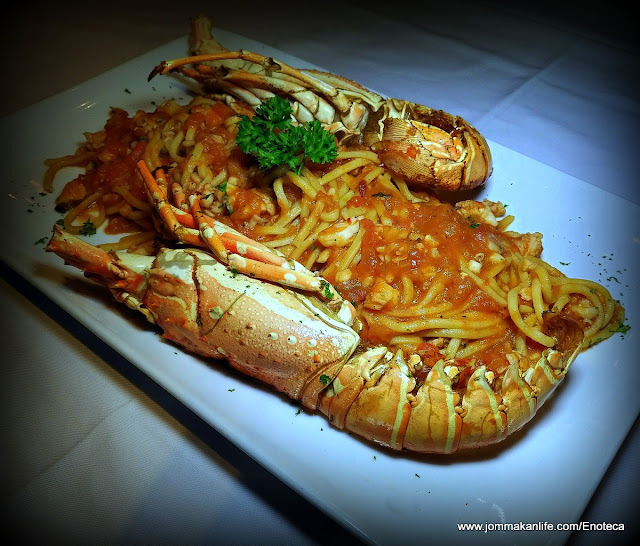 Positioned as a casual fine dining Italian restaurant serving up non-halal Italian cuisine, Mimmo assured us Chef Stefano strives to keep the house specialities as authentic as possible. 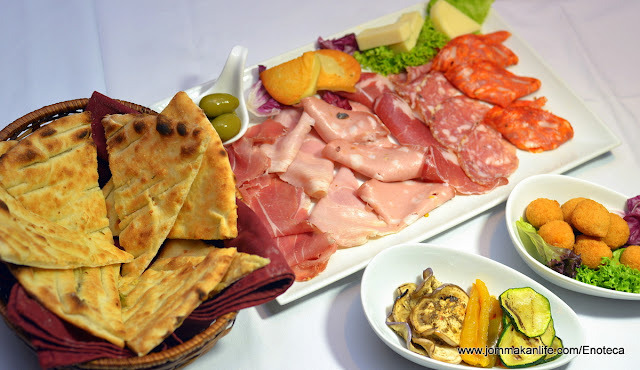 Naturally, diners will find a handful of specialities from both Roma and Abruzzo alongside more familiar pasta, pizza, mains and dessert. 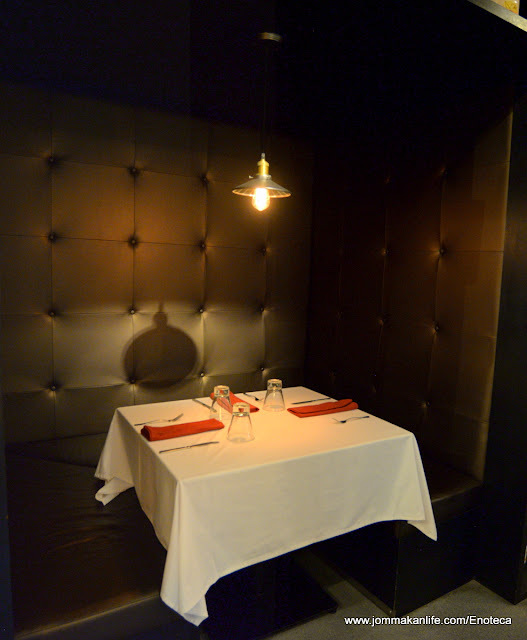 Interior-wise, the layout clad primarily in monochromatic shades remains intact. 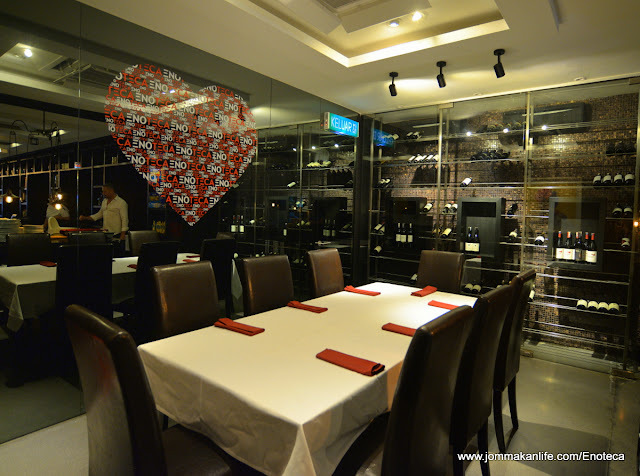 The intimate row of alcove seats are a magnet for romance seekers while a sleek floor-to-ceiling, glassy wine cellar takes pride of place at the back of the main dining space. 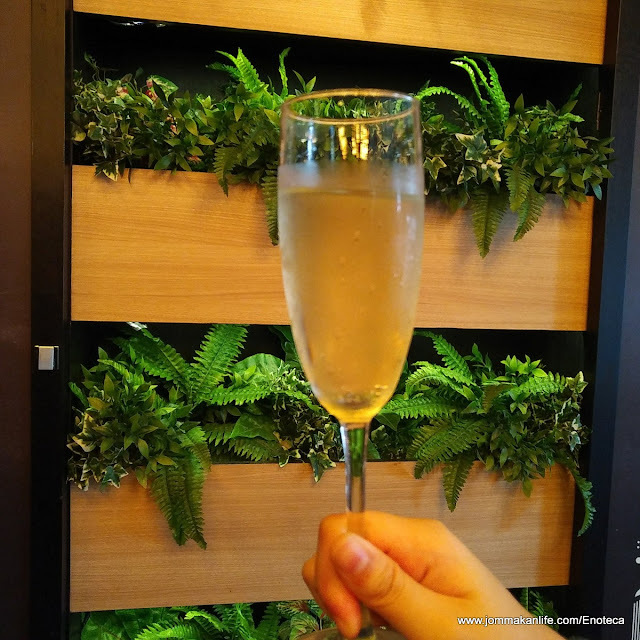 While we waited in anticipation for the chef's selection to be prepared, Mimmo treated us to an uplifting glass of sparkling Prosecco. 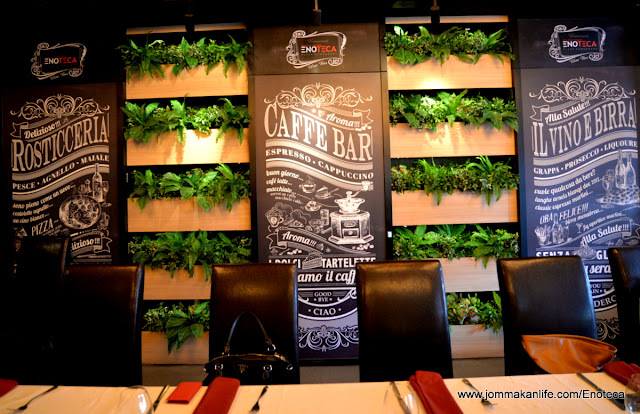 The perfect ice-breaker to pave the way for the signature Tagliere Enoteca (RM99 full serving; RM50 half serving). Freshly baked garlic focaccia served as the delicious canvas to showcase the six varieties of premium Italian cold cuts, two types of Italian cheese and antipasti: grilled vegetables and arancini (cheese stuffed rice balls deep-fried in breadcrumb coating). 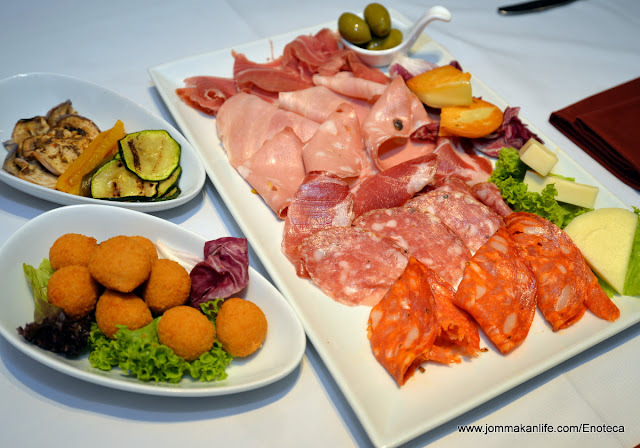 A substantial platter designed for sharing so it went down a storm with us from the get-go. 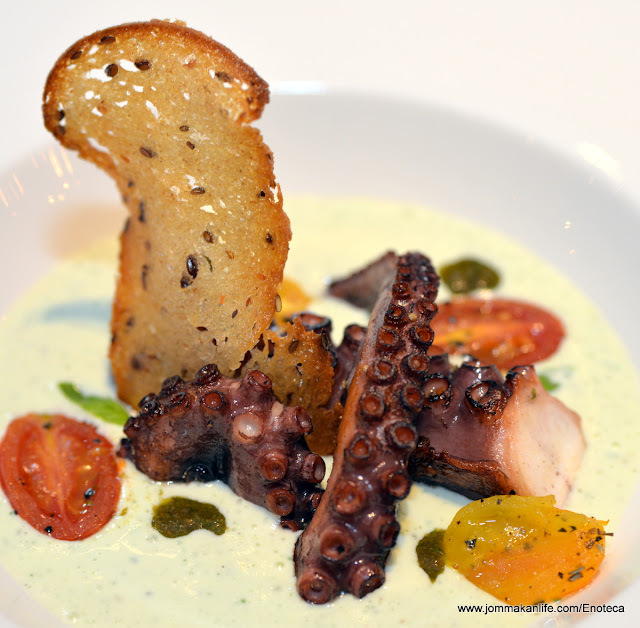 Octopus is the 'it' seafood now, its versatility revered by chefs from the East and West. 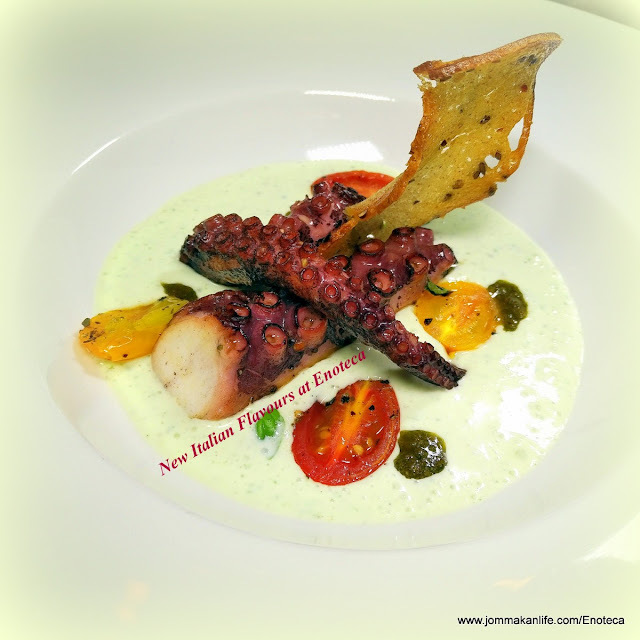 At Enoteca, the sublime Piovra Arrosto Con Spuma Di Burrata & Pesto Rosso -- boiled and grilled octopus with mousse of burrata cheese and red Mediterranean pesto sauce knocked our socks off with its appetising textural and flavour composition, whetting our appetite for the much anticipated feast ahead. "NO cream!" 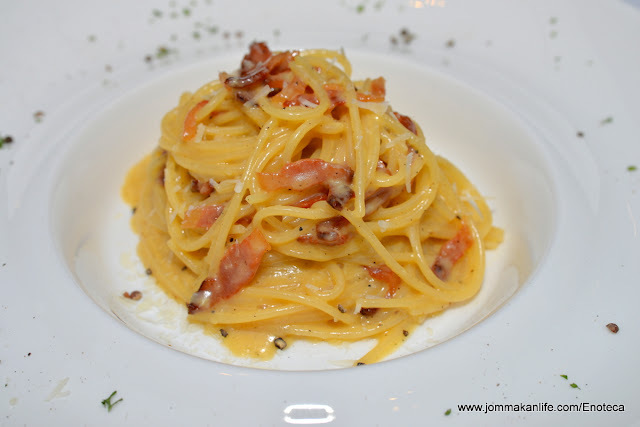 declared Mimmo when he presented the Spaghetti Alla Carbonara (RM35) with a flourish. Yup, real spaghetti carbonara doesn't include cream. Instead, the lightly rich sauce was made using eggs, black pepper and pecorino cheese. The suckerpunch of deep-seated savouriness was bestowed by bits of guanciela -- fatty Roman pork cheek bacon. It was soooo good! Ah, rivalling the spaghetti in the taste department is Chitarra Alla Montanara, an egg pasta typical of Abruzzo; the strands cut using an implement known as chitarra (pronounced key-tahr-rah, Italian for guitar). Tossed with porcini and chunky Italian sausage in brown sauce perfumed with truffle oil, the scrumptious housemade spaghetti was a befitting tribute to Chef Stefano's roots. Want something luxe to sink your teeth into? Then call ahead a day in advance to request for the new speciality of Chitarra Alla Aragosta. 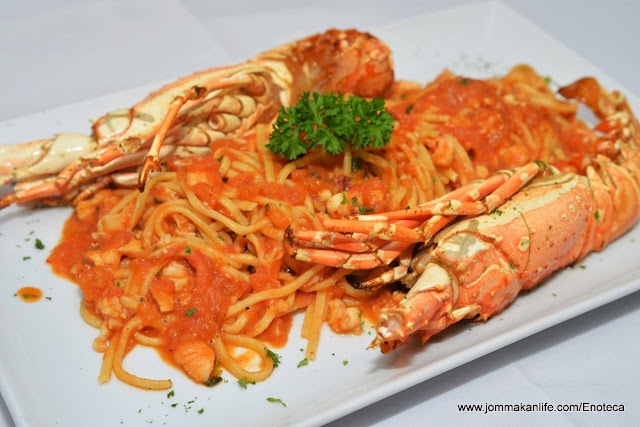 Sautéed with chunky tomatoes, the pasta embraced the delicate sweetness of lobster meat, making it a sumptuous delight to relish. 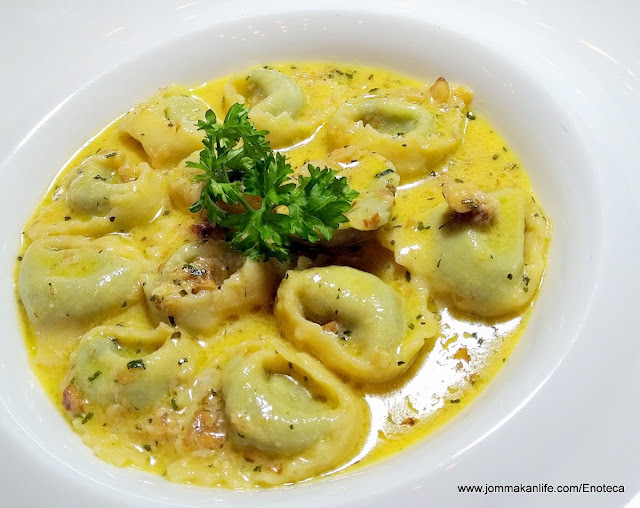 Creamy, aromatic butter sauce with crushed walnuts lent warm rusticity and comforting appeal to Cappelletti Di Ricotta, Spinaci In Salsa Di Burro Aromatico & Noci (RM32), another new menu debutante. Any Italian mama worth her salt would approve of the tender, handmade ravioli dumplings filled with ricotta and spinach in that pool of sinfully lush sauce. The wood-fire pizza oven on premise means this perennial Italian fave is guaranteed to be on-point. 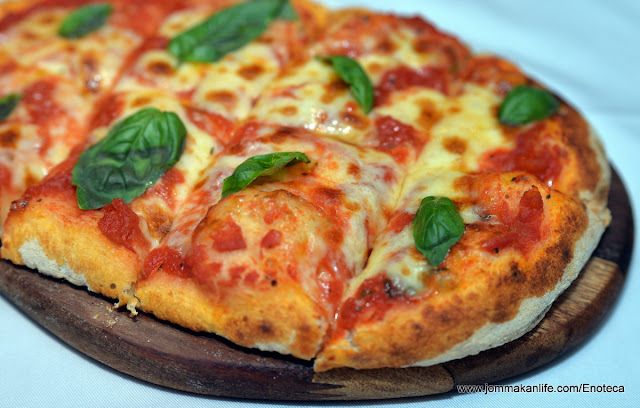 Simplest but the best representation of a true Italian pizza has to be the classic Margherita & Basilica Pizza (RM26). Generous slather of tomato sauce, lots of mozzarella and fresh basil atop a thicker than usual crust ensured this pizza was superbly satisfying. 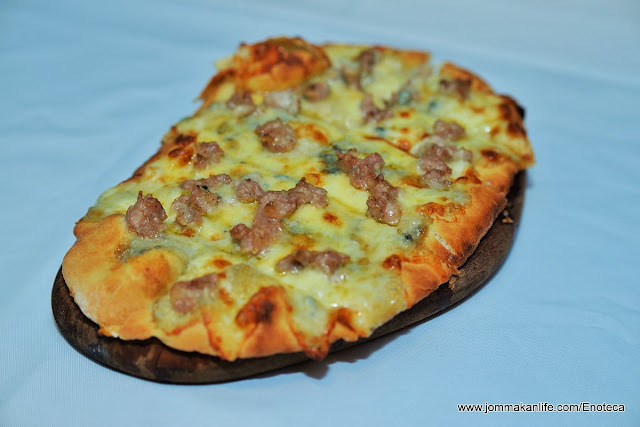 Another variant that got the nod from us was the Gorgonzola Salsiccia Pizza -- a winsome dual topping of melted gorgozola cheese and chunky housemade pork sausage. Apple cider vinegar formed part of the marinade for the pork chops or more correctly, Costoletta Di Maiale Ai Funghi Porcini & Raviolo Di Patate & Mele Al Ginepro. 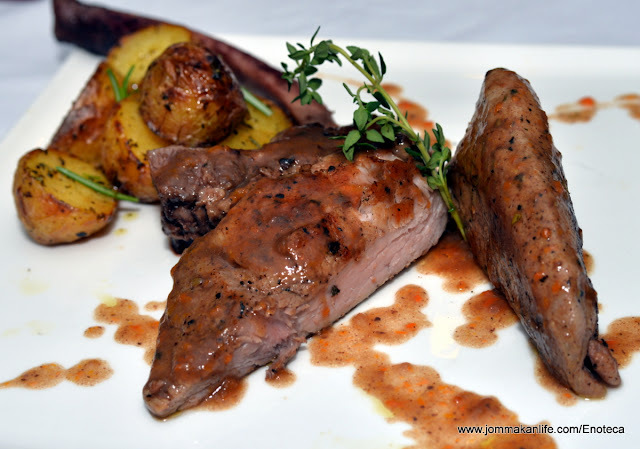 According to Chef Stefano, the meat was marinated for 24 hours before it was sou vide. To complete the dish, the pork chop is seared and served with demi-glace alongside roast potatoes. 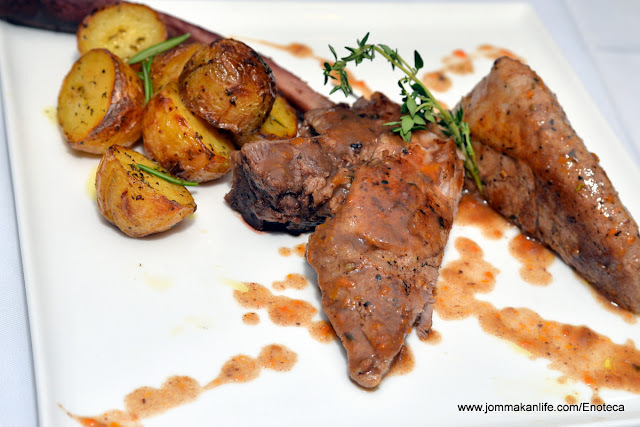 While the saucy pork jus splatters didn't do justice to the look of the dish, we assure you the resultant taste scored highly among our dining party. 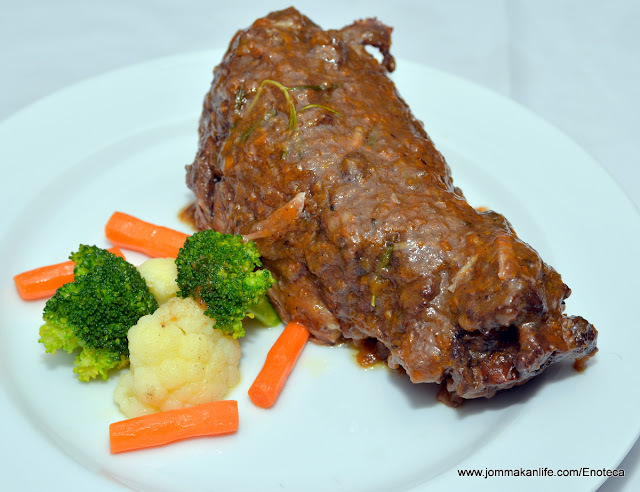 More pork for thought appeared in Stinco Di Maiale Alla Birra E Miele (RM68), Chef Stefano's signature Italian pork shank braised in red wine served with boiled vegetables. 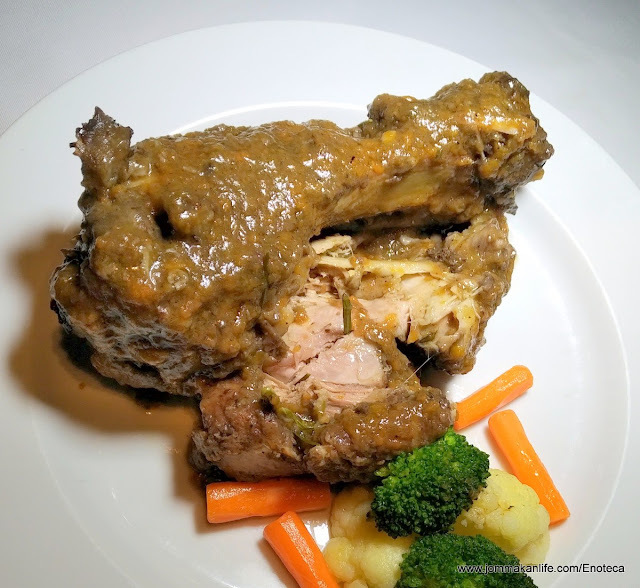 While the meat was tender, it remained toothsome to the bite and suffused with the discernible wine and herb accents. A dish evocative of a heartwarming Italian hearth and home. 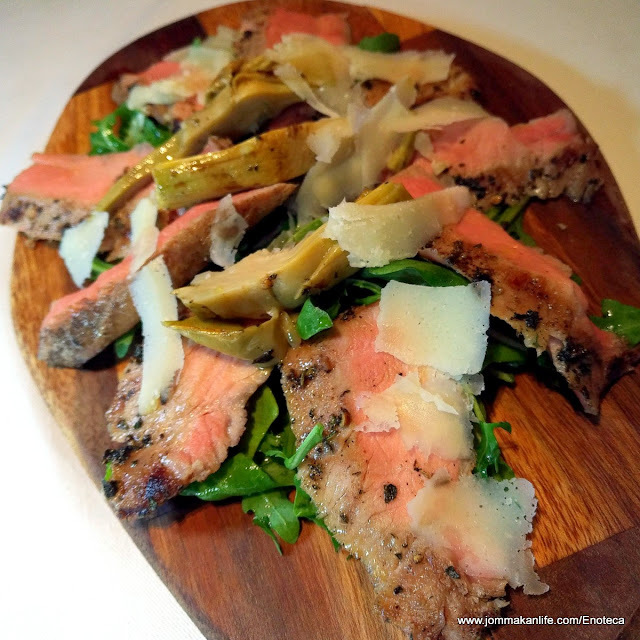 Appreciative oohs and aahs were heard the minute our palates got a sampling of Tagliata Di Pluma Iberico Al Tre Pepi Su Letto Di Rucola & Carciofi Grigliati (RM105), Iberico pork neck slices with 3 types of peppercorns. Grilled and served with rocket and marinated grilled artichoke, we made short work of the yummilicious pork secretly wishing for more. 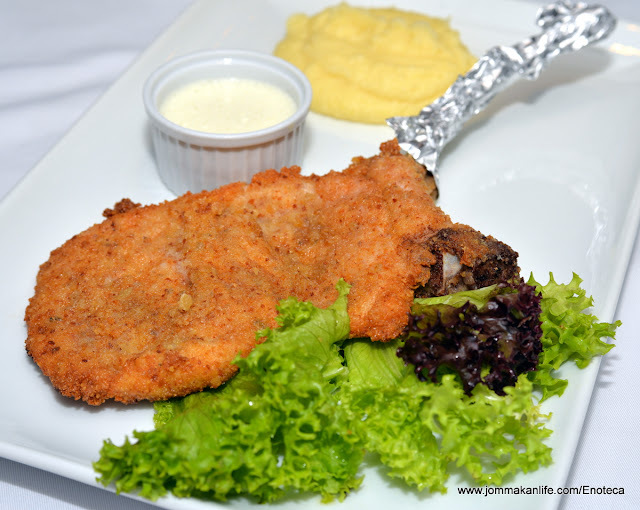 Less is more holds true when it comes to La Milanese (RM32), a deceptively pared down fried pork chop. The flattened and lightly breaded fillet cooked in clarified butter left us smitten; its juicy sweetness resonated on our tastebuds via creamy mash potatoes and the housemade yoghurt dip. Italians are sticklers for tradition hence there's no surprises in the dessert department. 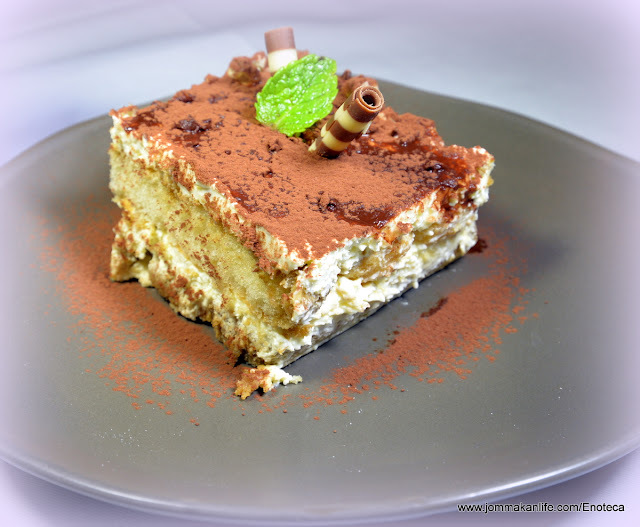 Most diners wouldn't dream of leaving without the typical pick-me-upper of Tiramisu (RM24). 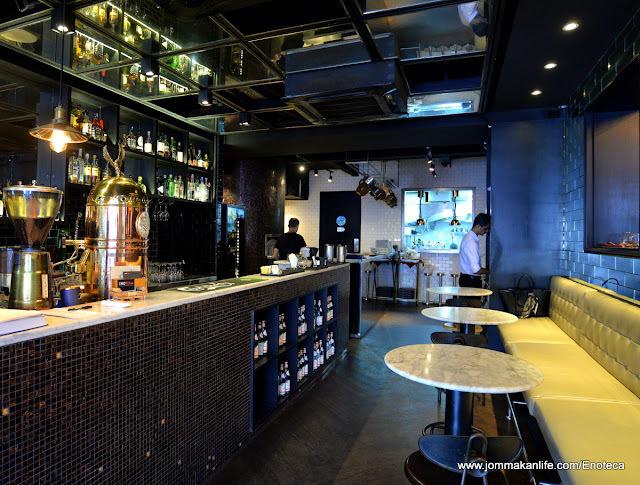 The coffee-flavoured ladyfinger sponge layered with mascarpone was mildly laced with alcohol but upon request, you can order extra shots of grand marnier to give the dessert more boozy kick. 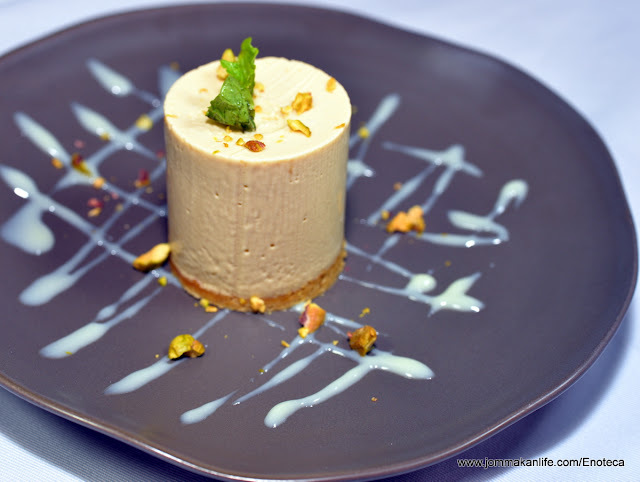 I particularly enjoyed Semifreddo Al Pistacchio (RM24), frozen pistachio mousse with its pistochio biscuit crust. A defyingly simple treat to leave an indelible impression if you're partial to everything nutty. 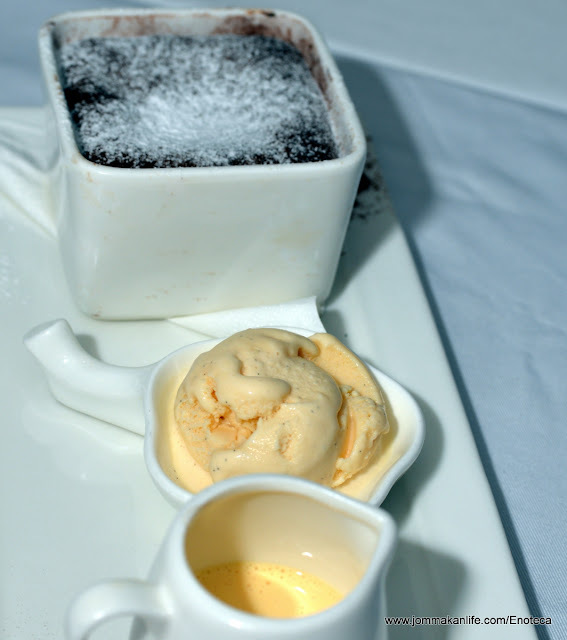 Surefire crowd-pleasing Chocolate Lava (RM28), warm molten chocolate cake with vanilla gelato is on the menu too. Dark, fluffy and oozing with liquid chocolate at the core, most people will find this too irresistible to pass up. 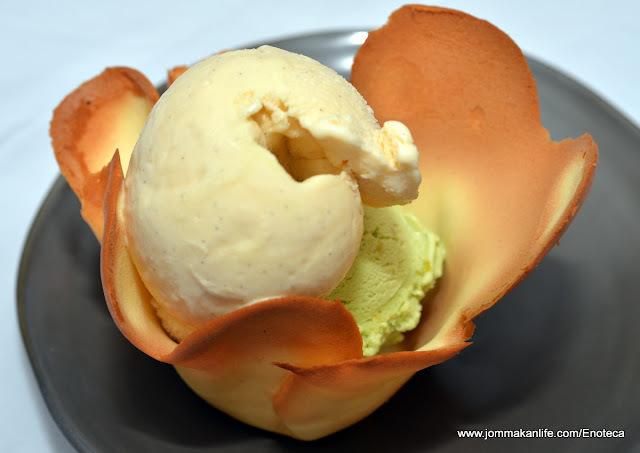 Again, the failsafe option is to savour the house-churned I Nostri Gelati (RM15) in a choice of pistachio, chocolate or vanilla. 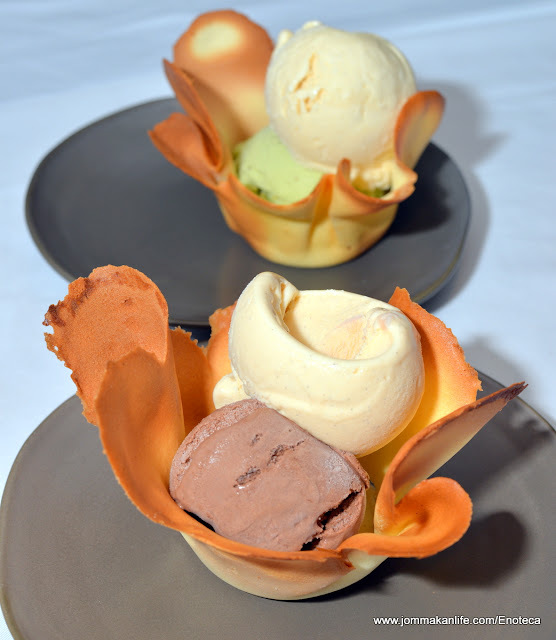 Served in cialde, housemade wafer 'flower' cups, the cool treats wrapped up our visit to Enoteca on a pleasantly sweet note. 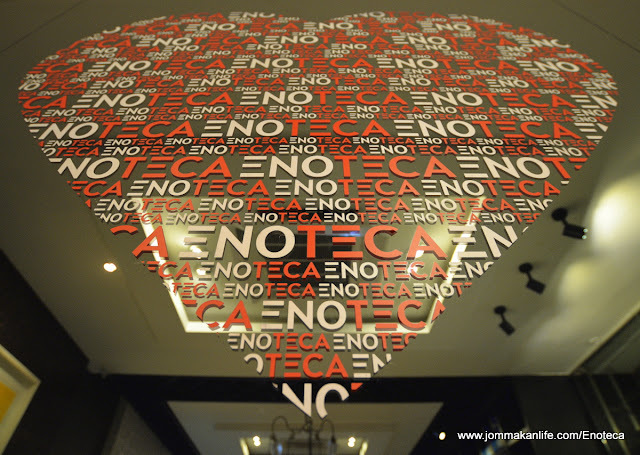 For reservations, call Enoteca Italian Restaurant KL, tel: 03 2011 5725. 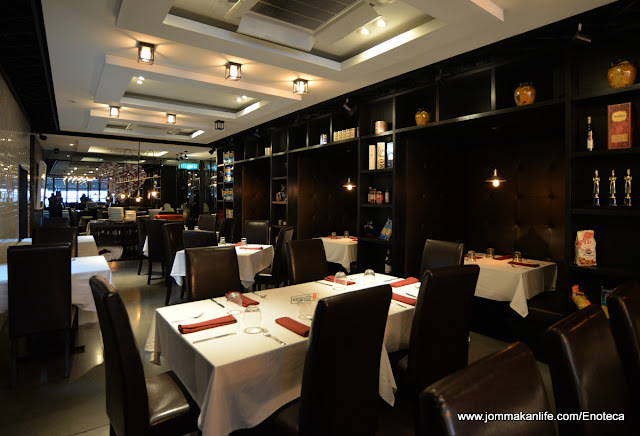 Address: 15 & 17, Plaza Damansara, Jalan Medan Setia 1, Bukit Damansara, Kuala Lumpur.